Retired Thoroughbred Rock n’ Bid in action. Photo by Katherine Turnbull. The journey officially begins today for 673 accepted trainers on the road to the 2019 Thoroughbred Makeover, presented by Thoroughbred Charities of America. This is the second-highest number of accepted applicants in the event’s history. The 2019 Thoroughbred Makeover will take place October 2-5 at the Kentucky Horse Park in Lexington, KY. Accepted trainers are encouraged to register their horses as soon as they acquire them at www.tbmakeover.org. Final horse registrations must be complete by August 1. The Thoroughbred Makeover is a training competition open to professionals, juniors and amateurs to compete side-by-side. 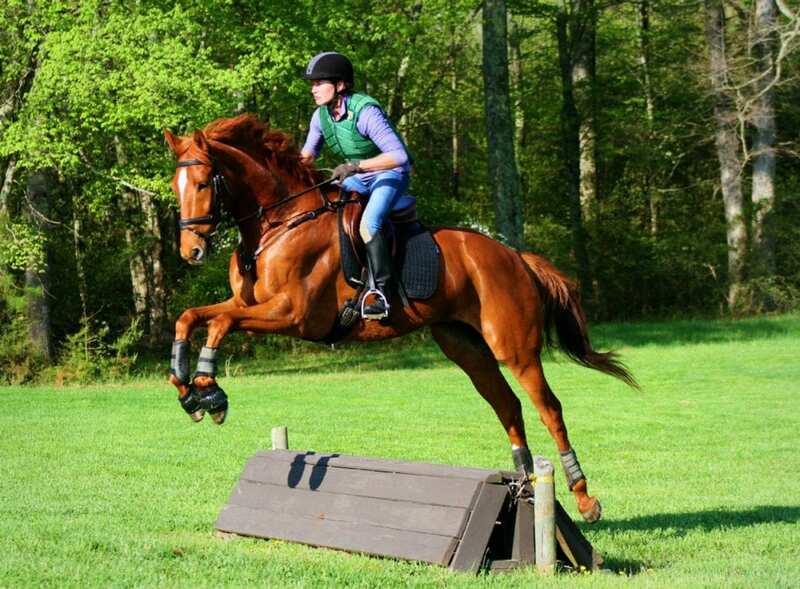 Ten disciplines of competition are offered, including barrels, competitive trail, dressage, eventing, field hunters, polo, ranch work, show hunters, show jumpers, and freestyle (a free-form division to demonstrate skills of the trainer’s choice). Spectators, in person and watching from home on livestream, vote for America’s Most Wanted Thoroughbred via text message — the horse that inspired them the most, out of the winners of each of the ten disciplines. The application process for the 2019 Thoroughbred Makeover required trainers to demonstrate their skills and expertise through competition results, videos and references. New changes for 2019 also required a letter from a vet stating that the applicant had the necessary skills and knowledge to appropriately care for a horse transitioning off the track. The Retired Racehorse Project’s selection committee took into consideration both candidates’ ability to effectively retrain an off-track Thoroughbred and candidates’ commitment to the RRP’s mission — promoting off-track Thoroughbreds for second careers. The selection committee overall was impressed with the quality of horsemanship in the final pool of accepted trainers. The Makeover has historically attracted a broad cross-section of the horse industry, represented by juniors, amateurs and professionals — and with the incorporation of team competition as a trainer status, show barns, intercollegiate and interscholastic teams can participate as well. The great equalizer at the Makeover are the horses: eligible Thoroughbreds competing in 2019 will all come from similar backgrounds. They’ll have had a maximum of 10 months of retraining for a second career and will have raced within the past two years. This format allows all trainers — juniors, amateurs, professionals and teams — to compete side-by-side on equal footing. Juniors and amateurs have enjoyed great success at past Makeovers; the 2017 America’s Most Wanted Thoroughbred, Old Tavern, was trained by junior Charlie Caldwell. Accepted trainers for 2019, alongside Wallace, include champion colt starter Dan James of Double Dan Horsemanship, National Finals Rodeo champion barrel racer Fallon Taylor, two-two-time Breeders’ Cup-winning jockey Rosie Napravnik (now an eventer), 4* eventer Ellen Doughty-Hume and professional film industry horse trainer Ryan Peterson. The full list of accepted trainers for the 2019 Thoroughbred Makeover can be found at the event website. For riders seeking a well-started off-track Thoroughbred for competition or pleasure, the Makeover Marketplace will return, offering buyers the opportunity to trial ride and vet a horse right at the Horse Park, as well as watch it in competition at a world-class venue with plenty of atmosphere. Over 100 horses are expected to be entered in the Marketplace. Trainers for 2019 have signed up to bring a total of 723 horses. However, due to the uncertainty when training green horses, the length of time between acceptance of trainers and final entry, and the fact that some horses may sell before the Makeover, organizers expect final entries to be between 400 and 500 horses. In addition to a weekend of Thoroughbred competition and celebration of what makes the off-track Thoroughbred great, the Makeover also offers ample opportunity for education for both trainers and the public: educational seminars and panel discussion will take place on Friday, October 4, as well as the Makeover Master Class. Structured similarly to popular colt-starting competitions, but without the “competition,” the Makeover Master Class offers spectators the opportunity to watch experienced off-track Thoroughbred trainers assess a prospect’s conformation and movement, as well as demonstrate their process for initial training and first rides. A vendor fair provides plenty of shopping as well! The Thoroughbred Makeover is the flagship event for RRP, a 501(c)3 non-profit committed to increasing the demand for and value of Thoroughbreds in their careers after racing. Sponsorship opportunities are still available for the 2018 Thoroughbred Makeover. RRP is a membership-based organization and an engaged membership base is key to furthering the organization’s mission. For more information click here.